The ride across the island to West Bay was like a scene out of "Romancing The Stone". We were surrounded by thick, lush jungle-esque vegetation with no other car in sight. Unlike Michael Douglas and Kathleen Turner, our road did not wash away and we were not chased by armed Colombians, or Hondurans, either. By the time we arrived at our charming bungalow near the beach, the sun had come out and stayed that way for the next ten days. When we arrived at the tiny Roatan airport, welcomed by rain and intense humidity, I wasn't at all impressed, having left another rainforest known as Vancouver. Then we emerged from customs and were greeted by a soca band and gaggles of tanned, happy people waiting for return flights. Maybe we did come to the right place? The ride across the island to West Bay (where we were staying) was like a scene out of Romancing the Stone. We were surrounded by thick, lush jungle-esque vegetation with no other car in sight. Unlike Michael Douglas and Kathleen Turner, our road did not wash away and we were not chased by armed Colombians, or Hondurans, either. By the time we arrived at our charming bungalow near the beach, the sun had come out and stayed that way for the next ten days. 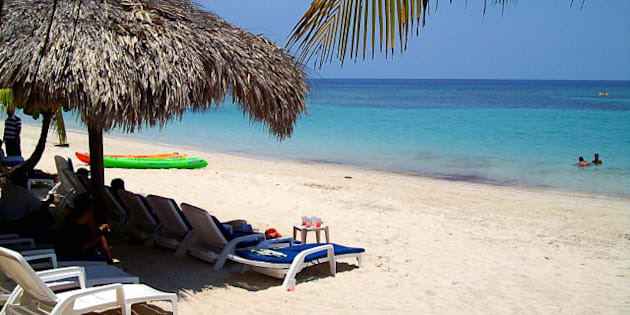 Roatan is the biggest of the Bay of Islands closely hugging the coastline of mainland Honduras. We were warned before traveling of recent unrest on the island, particularly a story I came across about a Canadian lad being shot dead for his iPhone last fall in a remote part of the island. You definitely need to be smart about how you approach travel on Roatan, but it all comes down to common sense and we encountered no issues whatsoever. While planning this trip, I found it hard to choose the perfect locale as each little village has it's own unique offerings. We eventually settled on West Bay which was perfect as it's known -- by locals and expats alike -- as the best beach on the island. There's also a charming strip of bars and restos along the beach, great snorkeling offshore and a few dive companies offering several trips per day to choose from. My husband was in scuba heaven. West Bay is also a 5 minute cab ride ($10 USD) or 10 minute water taxi during the day ($3 USD per person) to the West End, the more bohemian village north of West Bay. Here's where you'll find your backpackers, budget travelers, and plenty of Canadian and American expats livin' the dream. There's also some great art galleries, restaurants and bars - this is where everyone comes to party. West Bay Lodge is set amidst a tropical oasis of palms, mango trees and beautiful hibiscus. The inviting plunge pool is surrounded by charming, well-equipped bungalows, each with a hammock strung on the front porch. Located a few minutes walk from West Bay Beach guests are welcomed by three cheeky parrots, a stiff rum punch and friendly staff. Breakfast is included each morning at owner Celeste's restaurant onsite. Infinity Bay is an upscale, bio-sensitive resort situated right on West Bay Beach. One, two and three bedroom modern villas are available and rates are really reasonable, given it's prime location. Book early, particularly during Spring Break and Easter. With two locations -- one in the West End and the other on West Bay Beach -- the Argentinean Grill was our favorite place for finer dining. The atmosphere is rather romantical as you can choose to sit at a table on the beach with your toes in the sand, surrounded by glowing pyramids. The food is fresh and locally sourced. Consider the snapper -- whole fish, head and all -- or the lobster thermidor. You can't visit Roatan without a visit to Buena Vida in the West End. They serve up proper Spanish tapas, some of the best share plates you'll find on the island. The atmosphere is upbeat, located right across the street from the Blue Marlin...where you'll no doubt end up later. Picture, if you will, an outdoor living space set underneath a palapa, steps away from the beach...with hockey on all day. Sundowners is a Canadian-owned (obviously) beach bar with bartenders who appreciate the importance of a good caesar. This is the place to be for sunset and happy hour, which kicks off at 5pm daily. Two drinks for $5 USD. They also have free wifi. TIP: the password is always a player from the Toronto Maple Leafs. A visit to the West End on Roatan is not complete without getting your krunk on at the Blue Marlin. Most nights kick off with live music, but come Friday and Saturday night the place is packed while a DJ spins mostly hip hop and top 40. Situated on a deck hovering over the edge of the sea, this is where everyone congregates at night...eventually. Explore Cayos Cochinos from La Ceiba on the mainland with a guided tour by boat. Island hop, snorkel and have lunch in a Garifuna village. Protected by the government, the cays are off-limits to commercial divers and fishermen, leaving the sea life undisturbed and abundant. Little French Key is a private island resort, a short boat ride from French Harbour on the eastern side of Roatan. Maintained beautifully by a gentleman originally from California and his family, guests pay $88 USD for the day which includes the boat ride to and from, two drinks and grilled shrimp, fish and lobster for lunch. The most relaxing day you'll spend on Roatan. You cannot leave the island without spending some time snorkeling or diving the Roatan Marine Reserve. My husband did all his dives through Bananarama Beach & Dive Resort on West Bay and he was really happy with the crew there. Also, some of the best snorkeling can be found right off the beach as the reef wraps around the entire perimeter of Roatan. We spotted a red octopus in five feet of water off West Bay Beach one morning. Awesome. My only additional tips would be to leave all your bling at home. We bought pseudo wedding bands made of coconut and shells to wear for the week. Also, try to limit the use of your iPhone or other electronics to during the day if you're in a safe environment. Leave them behind when you venture out at night. Visas are not required for Canadians (and several other countries) staying three months or less, but check before you book. Oh, and bring your bug spray! Finally, try one of these...I dare you.